Code for Canada’s Community Network acts as a hub for the Canadian civic tech movement, convening organizers from across the country, fostering collaboration, and co-creating resources to support their work. These quarterly blog posts share the latest happenings from Canada’s civic tech groups, and highlight the benefits they’re delivering in their communities. 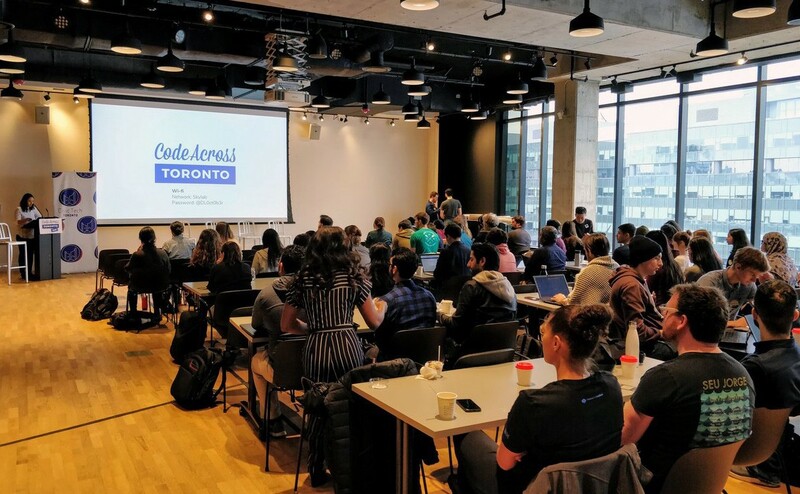 The crowd at the CodeAcross Toronto civic hackathon on March 2, 2019. Photo courtesy Civic Tech Toronto. The Civic Tech YVR community held their second event related to the City of Vancouver and the City of Surrey’s joint Smart Cities Challenge proposal. Representatives from both governments came to the hacknight, and were eager to get input from the community. Members of Vancouver’s civic tech group are also planning Hack YVR, a smart cities hackathon on March 30. If you’re on the West Coast, and looking for opportunities to use tech and design for good, check it out! Calgary’s civic tech community recently organized their second CodeAcross hackathon on International Open Data Day. The team at Civic Tech YYC worked on a number of projects in their first year — including Volly, a new tool that connects nonprofits with aspiring volunteers, a map of Calgary’s public art, and an exploration of how Blockchain could be for social good. CivicTechYYC also has lots of exciting ideas on deck for this year. BetaCity YEG bid farewell to one of the community’s founders, David Rauch, who left Edmonton for an opportunity in Austin, TX. David was a public servant, open data geek and a true civic tech champion. Whether it was organizing hackathons, founding Canada’s first civic tech group or helping launch Edmonton’s new Benefits Finder, he was always on the lookout for opportunities to connect government with civic techies. The team at BetaCity YEG wishes David the best in his new endeavours and wants him to know he’ll be missed at future hacknights. The civic tech community in Canada’s tech triangle has really been leaning into open source tools. The code for for their successful Waterloo Region Votes project has been made available for anyone interested in elections and civic engagement, and they’re investigating a way to fork the Bike Ottawa Map project (which was supported by members of YOW Civic Tech) and create a local version for Waterloo! The YOW Civic Tech team is hard at work planning a civic tech side event ahead of the upcoming Open Government Partnership (OGP) Summit on May 28. Stay tuned to their Meetup page for more information. To celebrate International Open Data Day, the team at Civic Tech Toronto held the fourth annual CodeAcross Toronto hackathon, bringing together civic hackers, tech and design professionals, academics, policy experts, nonprofits and engaged residents. This year’s theme was Sustainable Development, and project teams tackled issues ranging from waste reduction to helping settle newcomers. Canada’s newest civic tech group held its first meetup at the end of January! If you’re based in or around Halifax and would like to get involved, reach out to Aubrie McGibbon. The winter weather certainly didn’t slow down the folks at Civic Tech Fredericton. In January, the group debuted a data project mapping the city’s best and worst transit stops for senior citizens. They’ve also been hard at work on the Caring Calendar, a tool that will enable Fredericton’s faith-based groups to coordinate their efforts to help residents experiencing homelessness. Thanks for reading our inaugural update from the Canadian civic tech community. Check out the group nearest you to get involved! No civic tech group in your city? If you’d like to start one, visit our website or contact Kelly Halseth at kelly@codefor.ca to learn how Code for Canada can help!